Sometimes it amazes me how different cultures meet at a crossroads, like these beautiful cabbage rolls. They are called Sarmale in Romanian, Dolmades in Greek, Lahana Sarması in Turkish, Gołąbki in Polish, ロールキャベツin Japanese, and 圆白菜肉卷 in Chinese. Of course, each version is slightly different from the others. But the thing they have in common is that they are all comfort dishes that remind people of home gatherings. 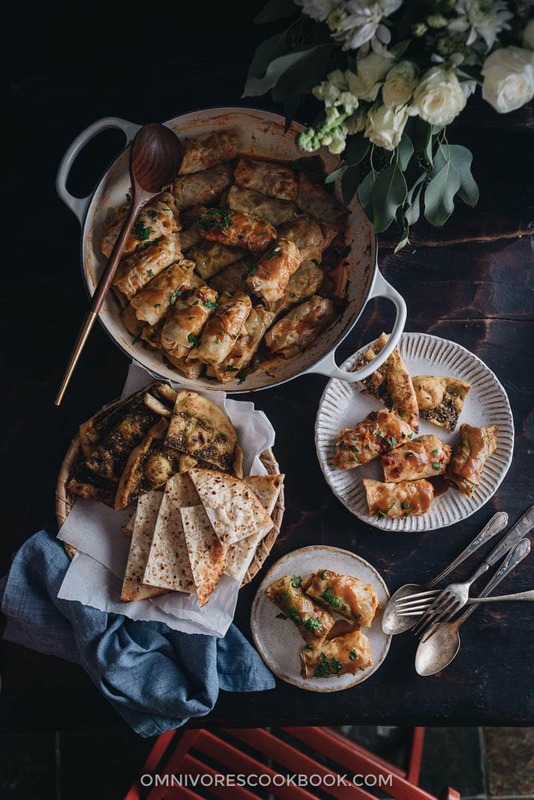 Today I’ll be sharing the Turkish version, a recipe I learned from Istanbul & Beyond – Exploring the Diverse Cuisines of Turkey, a beautiful cookbook about Turkish regional cuisine by Robyn Eckhardt and photographed by David Hagerman. At the bottom of the post, you will also find a giveaway for a chance to win one of two copies of this beautiful cookbook. I firstly met Robyn and David back in 2016, when they hosted a photography and writing workshop in Cambodia. Robyn, the blogger behind the award-winning blog Eating Asia, is a well-known travel writer whose work has appeared in The Wall Street Journal and Food & Wine. David is a famous travel photographer who shoots for Saveur and The New York Times. They are both American but travel around the world all the time to document the world’s people, cultures, and cuisines. During the workshop, I learned of how they traveled to Turkey, fell in love with the place, and decided to write a book about Turkish cuisine. To accomplish this project, Robyn and David traveled over 21,000 kilometers on the back roads of Turkey, documenting its regional cuisines. And they have been collecting recipes from locals over the past twenty years. If your understanding of Turkish food is limited to kebabs and baklava, this cookbook will totally blow your mind. You will find some well-known comfort dishes such as cabbage rolls, beef kofta, egg salad, and flatbread. You will also find some very intriguing dishes such as fava & bulgur stuffed grape leaves in tomato sauce and meatballs with pumpkin & spice butter. Fast forward to 2017, when I met Robyn and David again in LA at their book signing event. Melissa’s Produce hosted us and catered our lunch using recipes from the book. I was so hooked on the cabbage rolls that I had to make them, first thing after coming home. The filling is on the lighter side. It uses a nice combination of meat, rice, and vegetables to make a great tasting cabbage roll that’s not greasy. 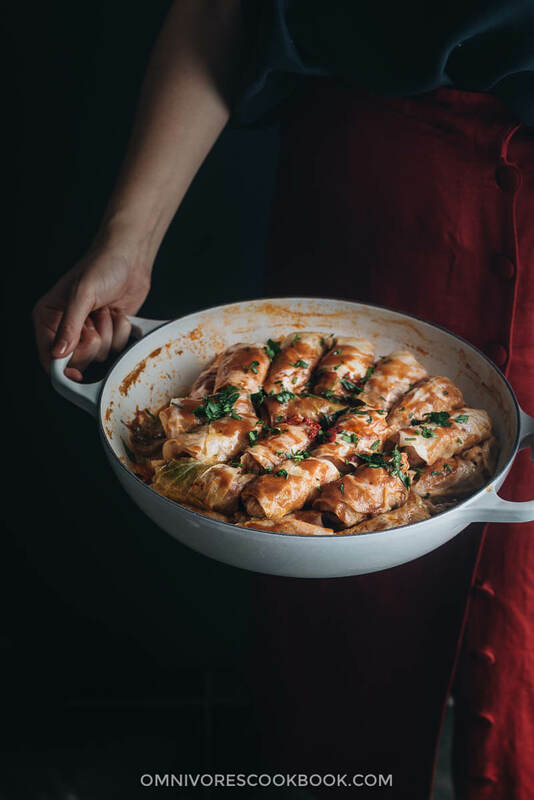 The cabbage rolls are bursting with flavor. Plenty of parsley, mint, red pepper paste, and chili peppers are added to make a rich flavor that is good enough to serve without the sauce. The tomato sauce is infused with sumac, which makes the sauce complex and rich, with very little effort. These are some of the best cabbage rolls I’ve ever tasted. They made me think of Chinese meatballs, which contain a lot of vegetables and some carbs to make the texture light and delightful. My husband loved the dish just as much as I did, and he complimented the sauce a couple times as we were eating. Yes, this is a dish that takes quite some time and effort to make, but you’ll find the results extremely rewarding. Please do make a full batch. They freeze well and the leftovers taste even better. 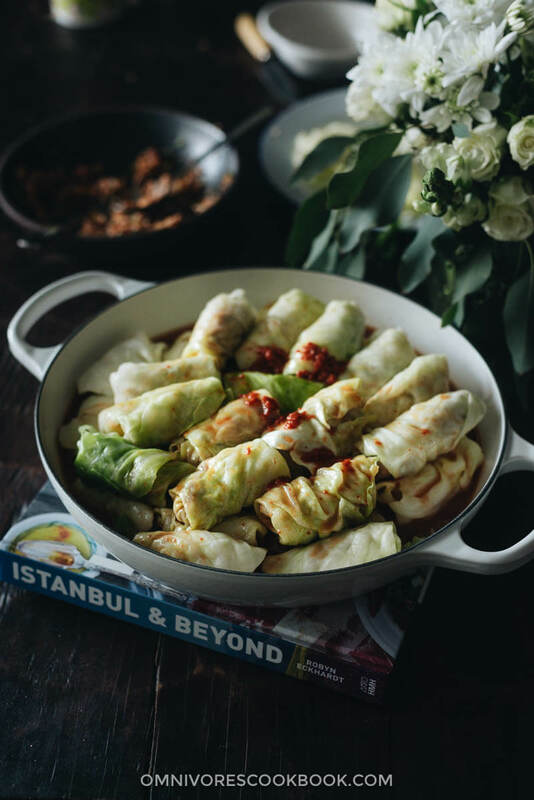 Today I’m excited to give away two copies of Istanbul & Beyond – Exploring the Diverse Cuisines of Turkey, so you will have a chance to flip through this beautiful book and try out the delicious recipes in your own kitchen. Ticket 1 (required): Leave a comment at the bottom of this post sharing the city you live in, and your experience with Turkish food (if you have any). Next year Robyn and David will be doing a book tour again and might visit your town! Ticket 2 (bonus): Follow @istanbulandbeyond on Instagram, and leave a separate comment below this post with your “Instagram handle”. Ticket 3 (bonus): Like this post on Instagram, tag a friend, and leave a separate comment below this post with “your Instagram handle” and “ticket three”. This giveaway will open on November 19th (Sunday) and will close on November 27th at 11:59 pm CST. Two winners will be selected via Random.org and contacted via email so please include a valid email address in the email address entry box (Your email address won’t appear on the website). 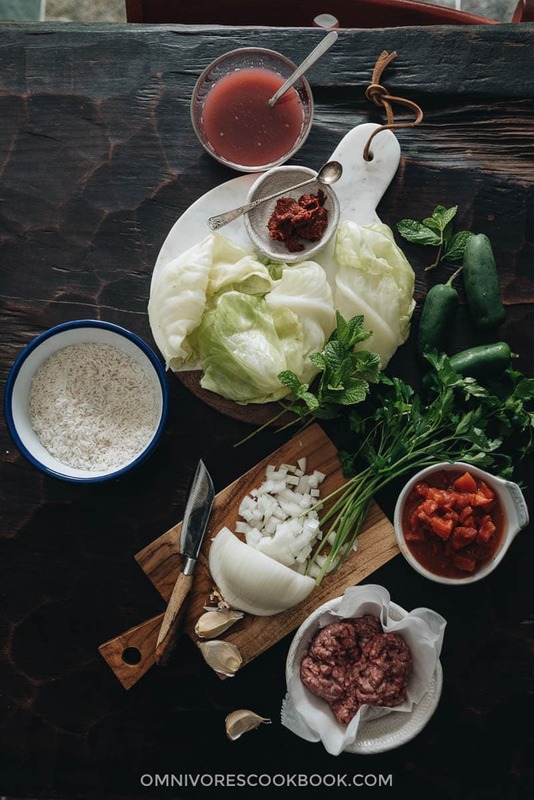 The recipe is from Istanbul & Beyond – Exploring the Diverse Cuisines of Turkey by Robyn Eckhardt and photographed by David Hagerman, with small edits and notes based on my own cooking experience. Add rice to a medium bowl and water to cover. Swish and gently rub with your fingers to rinse the rice. Drain off water and repeat two to three times. Drain and set aside. To make the sumac water for the sauce: add ground sumac to a small bowl and pour 2 cups hot water over it. Stir and set aside to infuse. Bring a large pot of water to a boil. (*Footnote 5) Add the salt. Cut a 1/2-inch (1-cm) deep X in the stem end of the cabbage and add it to the water. If using two cabbages, cook them one at a time. Bring the water back to a boil, partially cover the pot, and cook the cabbage until a knife inserted to its core meets no resistance, 12 to 15 minutes. Flip the cabbage 1 to 2 times if it’s not fully submerged in the water. Do not let the cabbage cook so long that it becomes mushy. Meanwhile, prepare an ice bath by adding ice and water to a large bowl. When the cabbage is cooked, plunge it into the cold water. When it’s cool enough to handle, remove it from the water, core it using a paring knife, and carefully separate the leaves, stacking them on a plate. Line the bottom of a wide 3-quart lidded pot with a layer of small and/or torn leaves. Set aside. Place the drained rice in a large bowl. Add the ground meat, onion, garlic, parsley, grated tomato, pepper taste, and chilies. Gently mix with your hands or a fork until the ingredients are just combined. Do not over mix. Sprinkle over the mint, red pepper flakes, salt, and black pepper. Mix again. Place a cabbage leaf on your work surface with the interior of the leaf facing up and the bottom of the leaf toward you. Use a sharp knife to cut out the thick stem and discard the stem. If the leaf is too big, slice it into two pieces so it’s easy to wrap. Place about a tablespoon of filling at the tip of the V and shape it into a log, leaving at least an inch between it and the edges of the leaf. 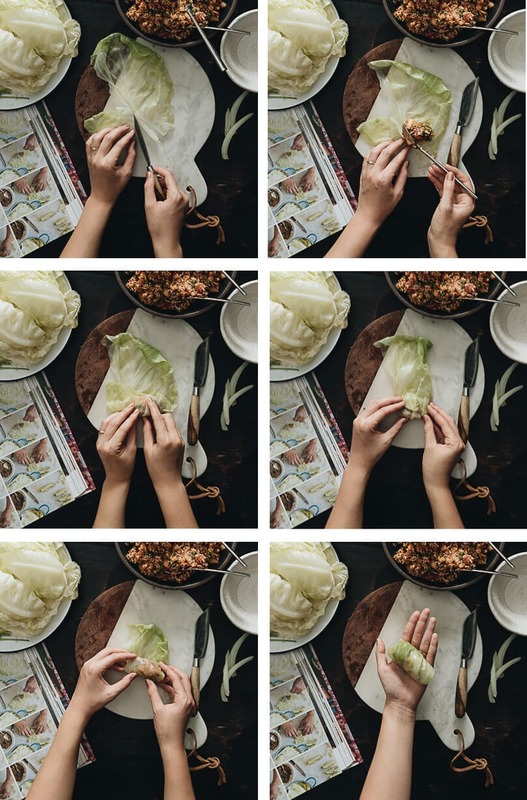 Fold the left and right edges of the leaf over the filling, then fold the bottom flaps of the leaf up and over, and roll it away from you to make a parcel. Don’t roll the leaf too tightly–leave room for the rice to expand during cooking. 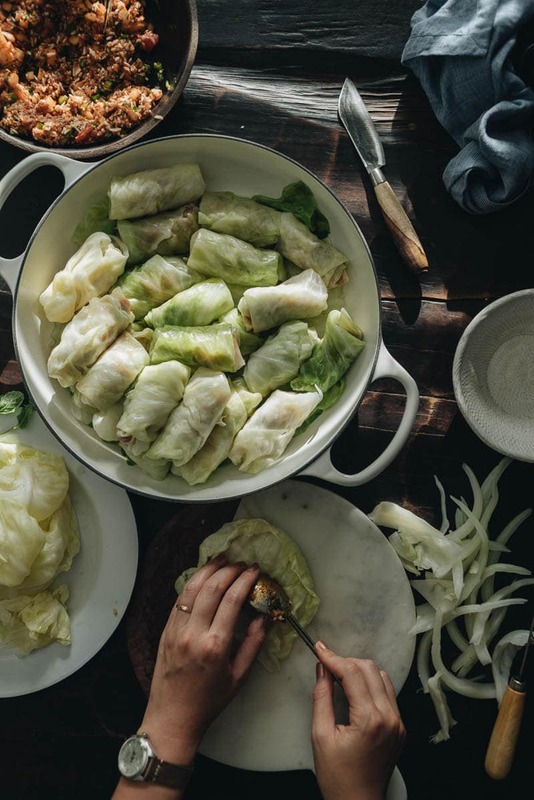 Place the cabbage roll seam-side-down in the pot and repeat until the filling is used up. Lay the rolls side by side, close together but not snug. Make two layers if necessary. Line a sieve with cheesecloth or a damp large paper coffee filter, and set it over a quart measuring cup or a medium bowl. Pour in the sumac water. Gather the cheesecloth around the ground sumac and squeeze it to release as much liquid as possible. Discard the sumac. Mix in the tomato paste, olive oil, and salt. Stir to mix well. Pour the sauce over the cabbage rolls. Heat the pot over high heat and bring the sauce to a boil. Lay a piece of parchment paper over the rolls and a heatproof plate on top of the paper, to keep the rolls under the sauce. Reduce the heat to low. Cover and cook for 30 minutes. Check after 15 minutes (use tongs to lift the plate and paper) to make sure that there is still liquid in the pot. Add 1/2 cup sumac water or plain water if the bottom is nearly dry. You want to end up with just enough reduced sauce to slightly coat the cabbage rolls. Let the cabbage rolls rest, covered, for at least 10 minutes. Store the remaining rolls in the fridge for 3 to 4 days. The leftovers will taste even better. I highly recommend you use two cabbages, so you will have enough cabbage leaves to wrap the filling. The original recipe used 1 medium tomato, halved crosswise and grated. I replaced it with canned tomato because fresh ones are out of season right now and canned tomato can yield better flavor. You can find the Turkish red pepper paste in a Middle Eastern grocery store. I highly recommend it. Alternatively you can use 1 teaspoon harissa paste (or less) to replace it. The original recipe uses 1 tablespoon fresh mint plus 1 teaspoon dried mint. The pot should fit the cabbage. However I found it is OK if the cabbage won’t fully submerge in the water. The original recipe suggested using 1 3/4 cup sumac water. I reduced the liquid because I was using a dutch oven and the sauce would not thicken enough if I used too much liquid. I suggest you start with 1 cup sumac water, then add more during cooking. I live in NYC and I have eaten Turkish food at my family friends’ home in Brooklyn. So yummy and flavorful! Don’t have much experience with Turkish food but I try it whenever I can! Never tried cooking Turkish food before but there is a first time for everything. I live in Tamarac, FL and I have never had Turkish food except coffee. This recipe looks amazing, thank you! Sumac is a wonderful flavor. I’m in Eugene OR, and am going to seek out local Turkish cuisine. I live in Newburyport, MA and haven’t had any experience with Turkish food. 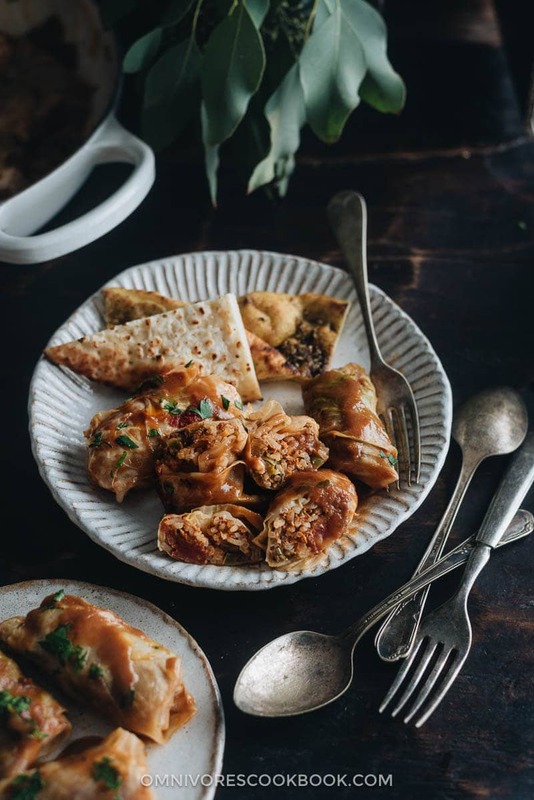 Los Angeles is a great place to try all sorts of food, I certainly had my share of kebabs and baklava, and I had something similar to the cabbage rolls in this recipe at a Polish restaurant, which was amazing. I am excited to give the Turkish version a try and would love to try other recipe in the cook book. I live in the suburbs of LA, California! I have never have had Turkish food before! But I would be game to try some! I love learning about different cultures and cuisines! I live in Manresa near Barcelona. I haven’t had much contact with Turkiah cuisine, so as I belong to a Mediterranean country, I’d like to have that inspiring book. I love in Ringwood, NJ. I lived in Doha, Qatar for 9 months and fell in love with the food of the region. My husband and I ate Turkish food all the time- one of our favorites! I live in Lubbock, Texas. I had a good friend in college who was from Turkey. She taught me some Turkish cuisine, how to knit Turkish-style, and also how to belly dance. (I was horrible at the last one. These hips don’t move like that.) we did love making meals together, and I would looooove to learn more. This looks delicious! Although I am not familiar with Turkish food, I have sumac in my pantry and this recipe would be a great way to use it! I live in Ellicott City, Maryland. Live in Brooklyn, but originally from Sydney, where Turkish food is a staple. Rarely a week would go by without Turkish pide for a shared after work snack or Saturday dinner with friends and wine. Always served fresh and hot, with cheese and herbs and nigella seeds. Such strong, delicious memories! I live in Annapolis MD and have enjoyed Turkish cuisine in such far-flung places as Vienna, VA and Kabul. I love lamb, and the Turks seem to have a special sense for preparing it in many delicous ways. This looks amazing! I’m in Tucson, AZ. A barren wasteland for Turkish food here – I’d kill for a lamb gozleme! I’m in to Turkish tea so why not add some food as well. I live in Prescott. I worked woth a lady from Turkey and she had me to dinner at her house. don’t remeber what we had. It was over 40 years ago but it was delicious. I live in Florida my sister in law comes from France I think that she knows a lot about Indian food I would love to win this book for her for Christmas I have never had any Indian food I used to live in Wisconsin , I and so I have never tried Indian food . I live on Camano Island in Washington State. Years ago I visited Turkey. Wonderful memories of generous people and luscious food. I live in Stockton, California and unfortunately, I’ve had no experience with Turkish food. I really love trying foods from all different regions and feel confident that I would enjoy Turkish food even if I’m the one who has to cook it. I live in a small town, Benton City. My experience has been with Middle Eastern food. Gyro’s, Shwarma, etc. I loved the gyro’s so much I found a wonderful recipe online and learned to make it at home. I’d love to try Turkish recipes. I live alone. Will these freeze well? The recipe sounds delicious. I live in Centennial Colorado and haven’t eaten much Turkish food but I love anything with sumac! These look very tasty! Also, you have some really great photos. I live in Berkeley CA. I had the good fortune to spend 3 weeks in Turkey two years ago and was amazed by the delicious food! I live in California and never tried Turkish food before. Excited to try out this cabbage roll! I live in Seattle and really haven’t had experience with Turkish food, but I would love to expand my horizons! These cabbage rolls look delicious. Can’t wait to try this recipe, I have sumac spice in the pantry ready to go!!! My instagram handle is @cowgirljfa! Hi! I live in Quincy, MA. I love to cook Greek, Lebanese, and Polish cuisine but do not have much experience with Turkish dishes. 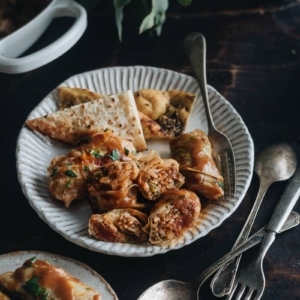 Polish cabbage rolls and Lebanese grape leaves are a family favorite, so I can’t wait to make these. I love the savory tang of sumac. 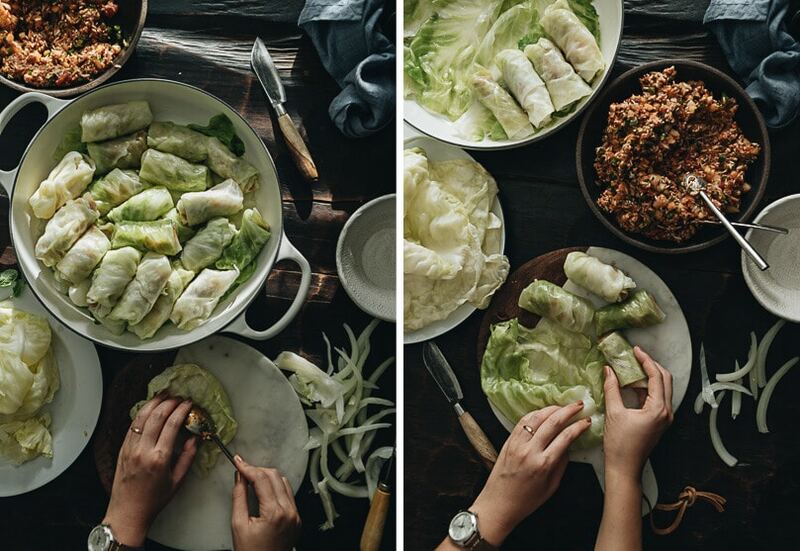 Absolutely stunning photography and fabuous tutorial for these gorgeous cabbage rolls. I have only tried Turkish food a little. This sounds great and I have Sumac in my pantry, so I’ll have to give this a try. I won’t find Turkish paste or peppers here, it possibly Harisa paste. I have a ground powdered version, but I’m sure that won’t be the same. What could be substituted for the Turkish paste? I’m on a small island in the Caribbean, so that will probably be impossible to find. They have Indian curry pastes and oriental pastes, but am guessing those flavors won’t work. Hi Cathy, by any chance you can find harrisa paste? If not, I think the best way to do is to roast some peppers in the pan or under the broiler, then blend it, to get that nice smoky aroma with a bit sweet and spiciness. I thought the cabbage rolls and sauce were worth 5 stars, though I had to make 2 major adjustments to the recipe. First, the rice was not cooked enough after 40 minutes. Granted, I used brown rice which takes longer (65 minutes according to my rice cooker), but even white rice takes 45 minutes according to it. Perhaps I have a slow rice cooker (I don’t think so) but at any rate you should be aware of that potential problem. I turned the heat on under the cabbage for an extra 20 minutes and it was fine. Of course, if you are going to do this you will most likely need to double the amount of sauce as the cabbage will be cooking a lot longer. And speaking of sauce, the sumac is such a wonderful spice and I really like it, but the sauce was far too thin for my liking. I like a thicker sauce and tomatoes go so well with this recipe so I put in the remaining diced tomatoes in it (7.5 oz) and about 3 oz more of tomato paste. I also added sugar to it. I did this all in the bowl so I could adjust the flavoring and then poured it over the cabbage rolls. Note these measurements are for the original recipe, so if you are going to double the sauce then double the amount I gave for the tomatoes and tomato paste. So taking these considerations into account, I really look forward to making this next time. It’s a winner.